The Camry you didn't see coming. The New 2019 Toyota Camry. Check out the most advanced Toyota Corolla to date. 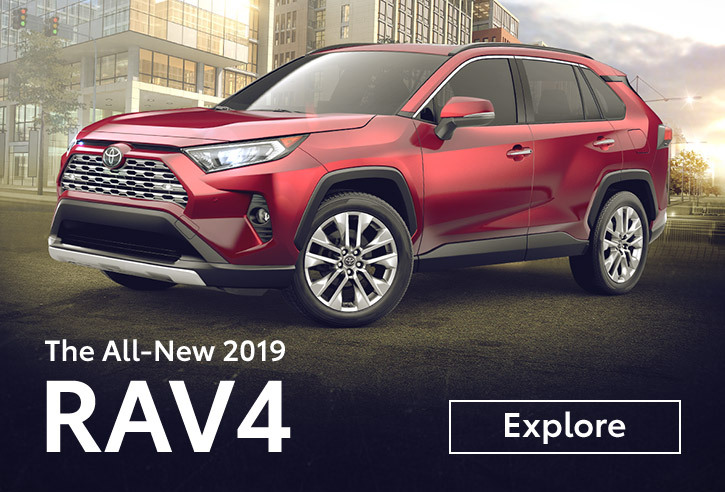 Explore more of Toyota RAV4 and where it can take you. Room to fit the whole family. Explore the 2019 Toyota Highlander. Discover Toyota Safety Sense: Accident Protection Technology. Take a look at these Toyota Accessory videos detailing all the great accessories designed specifically for your Toyota. Expect the highest quality service from our Toyota Certified Technicians, using only Genuine Toyota Parts. Every new Toyota comes with two years of no cost maintenance and 24-hour roadside assistance. 2019 EPA-estimated city/highway mileage. Actual mileage will vary.